Join the stars of the Celestial Choir as they guide the traditional nativity characters to Bethlehem singing some not-so-traditional, up-beat songs with a fabulous ‘showbiz’ feel. You’ll be star-struck from start to finish! Available with Words on Screen™ v2. Each member of the school Celestial Choir is vying to dazzle music teacher Mr Marrz, hoping to be awarded a ‘superstar’ role in this year’s nativity. To her surprise Stella - who often gets things wrong but always tries her very best – is picked to play the part of the Star of Bethlehem because she understands the heart of the Christmas message. As the special performance unfolds, the children shine a light on the traditional nativity story and point to Jesus being the true superstar of Christmas. 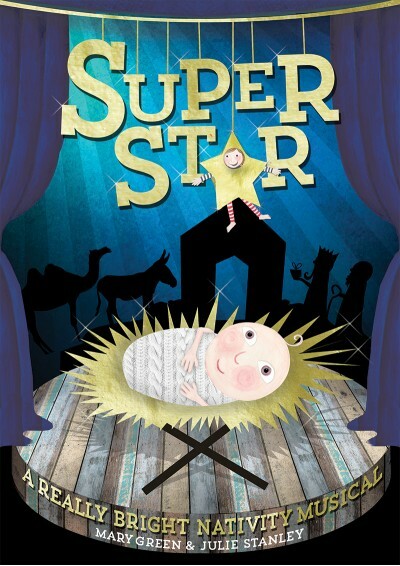 With 8 upbeat songs and a fabulous script, Superstar is a dazzling nativity play for the primary age group. Please Can I Have A Room? We're Not Washing Our Socks! There are 64 parts in total, which can easily be increased by adding more stars, shepherds, angels, stable animals and courtiers and can easily be decreased as suggested below. There are 58 speaking parts, but these can easily be reduced (30 being the minimum) by using five of the stars as the five narrators (the rest of the stars could double up on parts and become some of the travellers); you could adapt the script and lose some of the travellers’ lines; Mr Marrz could double up as Joseph; the three innkeepers could double up as three shepherds with the eight lines distributed between them; the angels’ speaking parts could be reduced from four to two. This was such fun - catchy tunes, great dialogue and easy to put on for a small school. Clearly the writers understand the logistics of school productions as there was a lot of scope for optional roles so everyone could have a speaking part. Parents said it was our best show ever! I loved performing this play it really was my chance to shine!! In case you haven't guessed yet i played Stella. I really loved he fact that th beginning was auditions and the rest the play. The songs are good but I think a couple more solos wold make it even better !